LG's Rechargeable 3D Glasses will be $199.99 - Is There a Conspiracy? 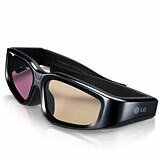 LG's rechargeable 3D glasses (model AG-S100) will retail for $199.99. This is the same price as Samsung's rechargeable 3D glasses (model SSG-2200AR). Likewise, Samsung's battery-operated glasses (model SSG-2100AB), are the same $149 price as Pansonic's battery-operated glasses (model TY-EW3D10U). Given that manufacturers have been unable or unwilling to standardize around a single 3D transmission technology, they have done a remarkable job at standardizing on pricing. Until XpanD, an independent 3D technology maker, brings out their "universal" glasses this spring at $125-150, we will have no choice for lower-priced glasses. And, in our recent discussions with XpanD, they say that their universal glasses are only certified to work with Mitsubishi and Vizio TVs. I hope that XpanD is able to get deals worked out with the other manufacturers as soon as possible so we have some choice in this space. And hey, manufacturers, if you're reading this, please get those deals signed. We want our 3D!